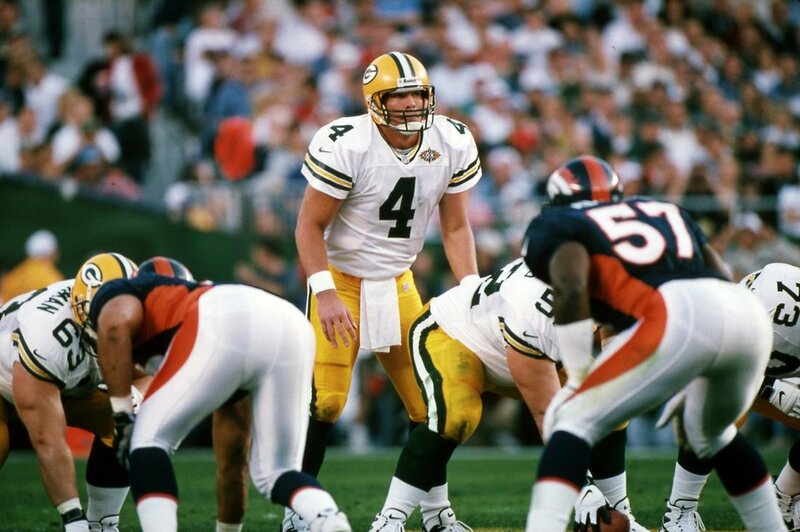 ​​​​In one of the most eagerly anticipated match-ups in years, Super Bowl XXXII saw Denver's John Elway face-off against Green Bay's Brett Favre in the paradise-like setting of a warm California evening in San Diego. 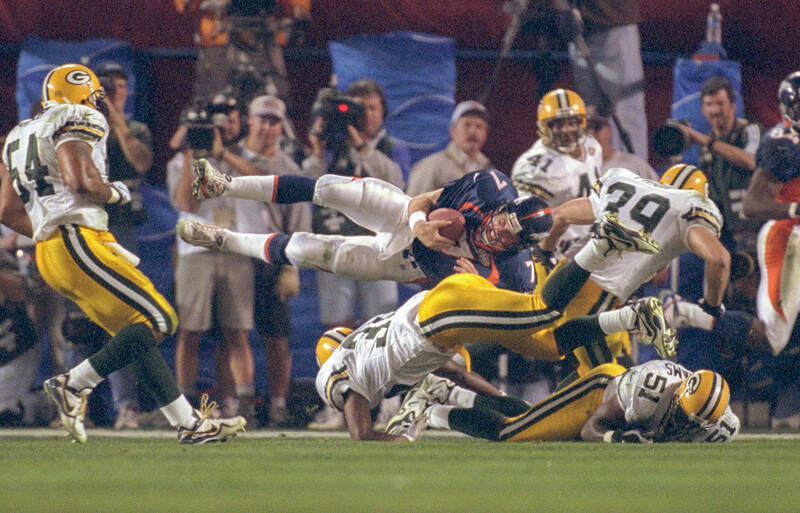 Anyone who wasn't a Packers' fan, was pulling for the Broncos. 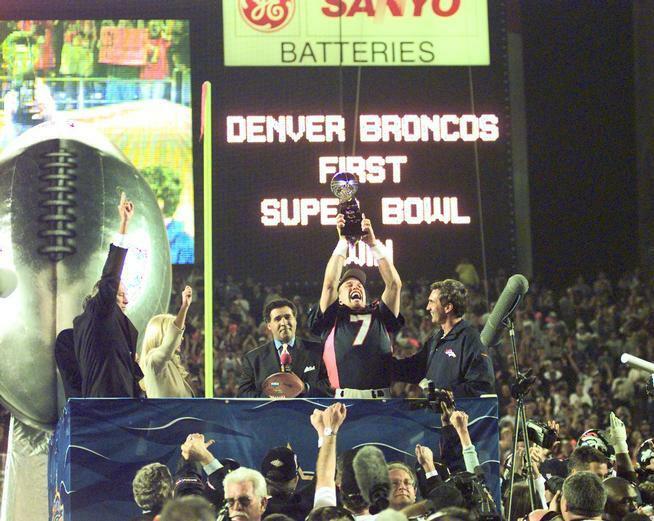 Or more accurately, they were pulling for John Elway. It was his fourth trip to the big game, and the previous three had been a string of increasingly heavier defeats. Add to that his team's upset loss to the Jacksonville Jaguars the previous post-season which came at the end of a year where everybody was picking the Broncos to win it all, and the sentimental favorite was clear. Green Bay, by contrast, came in to the game as defending champions, and had largely toyed their way through the regular season as if an appearance in the thirty-second Super Bowl was their right. The game was evenly matched throughout the first quarter, which ended 7-7, before the Broncos pulled ahead to 17-7 by late in the second period. 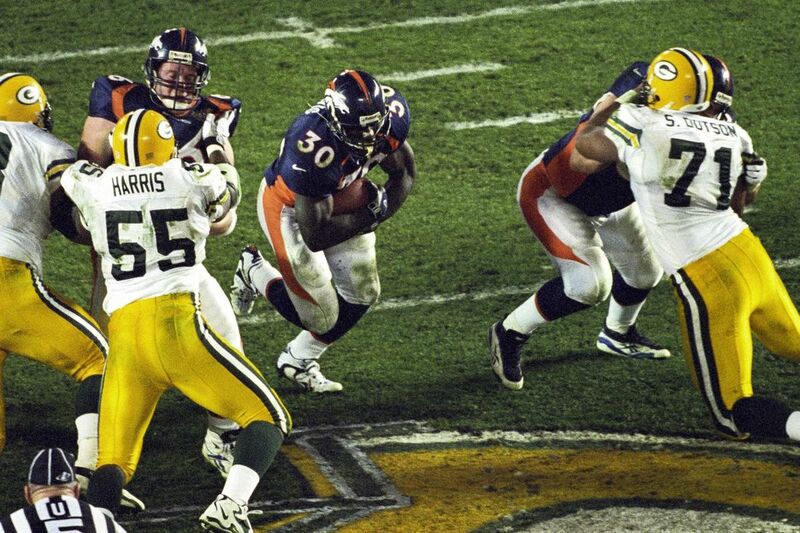 Green Bay would pull to within three points before the halftime break, but more worrying for the Broncos, was the loss of their star running back, Terrell Davis who was knocked from the game early in the second period. Davis would return, however, and much like Emmitt Smith in Super Bowl XXVIII, he would take control of the game, earning MVP honors as he notched up 157 yards and three touchdowns. Back-and-forth scores led to the Broncos approaching the end zone with less than two minutes to play and the score tied at 24-24. The Packers defense opted to let the Broncos score as Davis went untouched over the line. 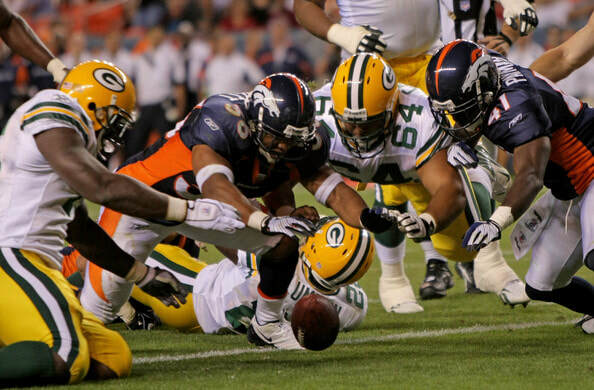 This decision was based on the Packers having a chance with the ball rather than let the Broncos run out the clock. 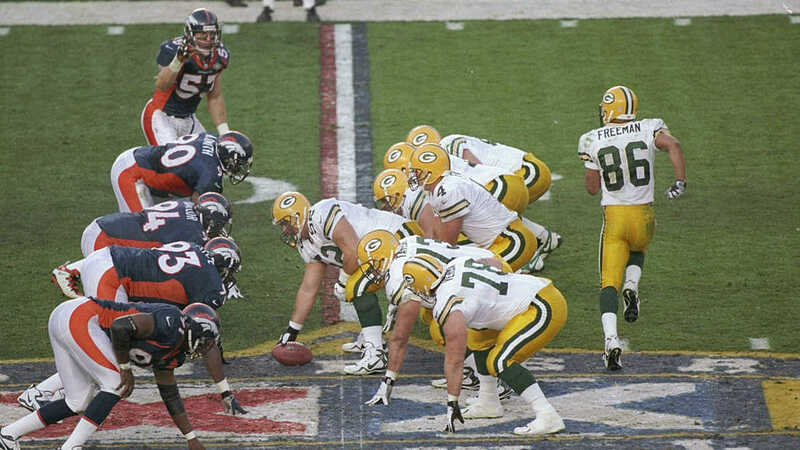 On the very next drive, Favre began edging the Packers down the field, eluding the Broncos' still fierce pass rush. 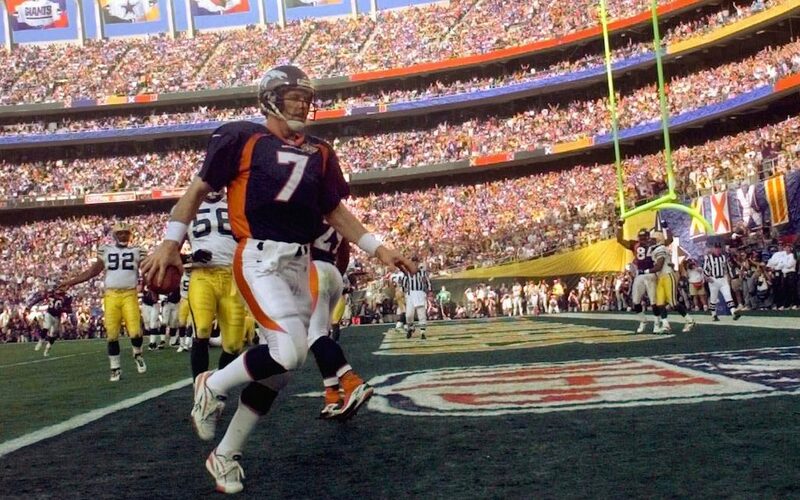 However, the Denver defense held on fourth down with only seconds remaining, preserving the win and handing John Elway and the Denver Broncos their first Super Bowl victory. 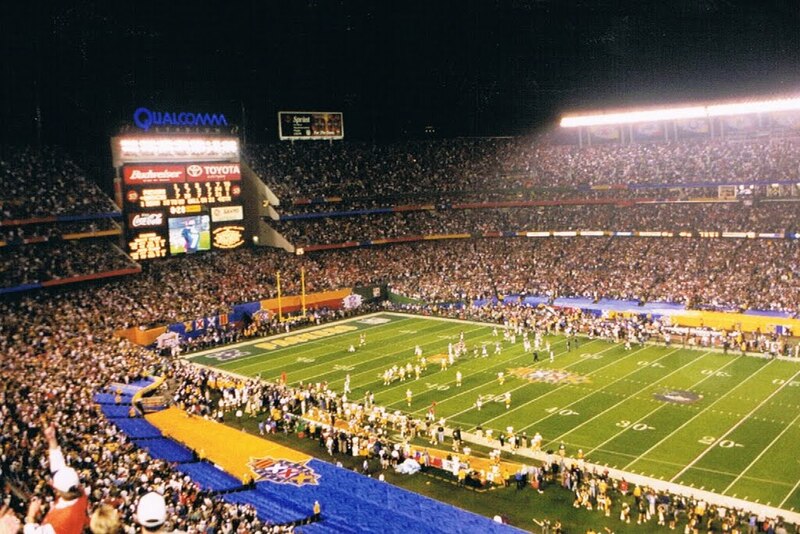 Although previous Super Bowls had seen the teams wear patches of the game's logo on their jerseys, Super Bowl XXXII would be the game that set the trend that saw every Super Bowl jersey adorned with its respective logo.